After two nights in a bit chaotical Athens and an one-hour flight, we finally arrived at the wonderful Ritz-Carlton-Tower directly at the Bosphorus. The Limousine stopped in front of the big entrance and the bellmen greeted us in a friendly way. After the security check we were accompanied to the Club Lounge on the 12th floor where we were checked-in. 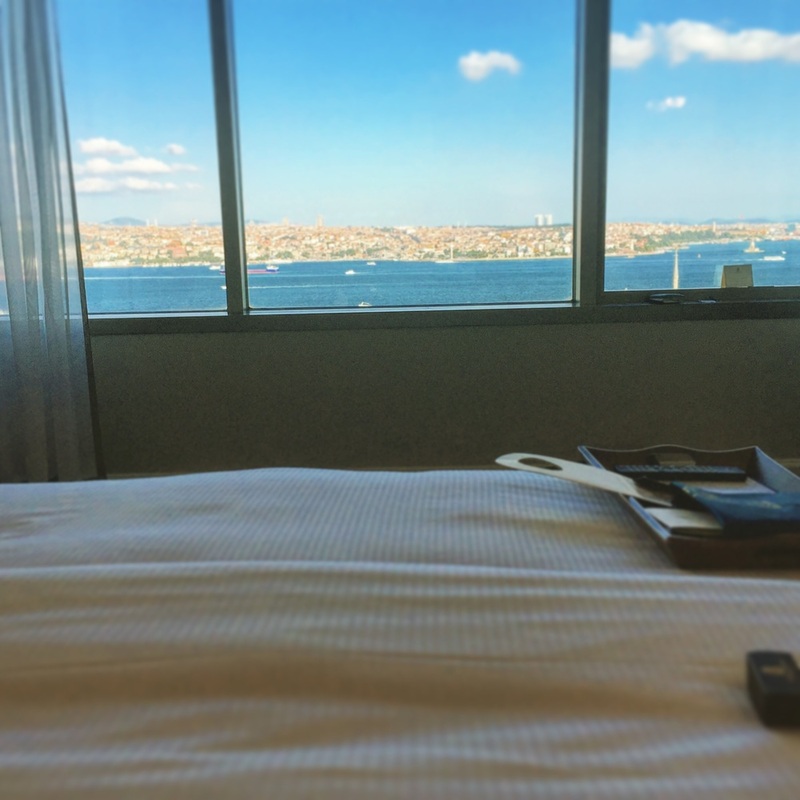 They upgraded us to an amazing "Front bosphorus view Club Room", actually the best rooms to get at this wonderful Ritz-Carlton property. A really big room with a bathroom held in white marble offering a bath tub, a separated shower and toilet, was waiting for us. In the Bedroom we were treated with a kingsize bed, a beautiful desk with two chairs and a big TV. All in all the view makes you forgettig everything else! Probably the best view of the Bosphorus: the bridge from Europe to Asia on the left, the Asian continent in front of you and the old town with its beautiful mosques on the right. At the bottom of the hotel, there will be a new soccer stadium, which will be a perfect add-on for all football lovers ;). After observig our room, we went up to the club lounge to realx and enjoy the view with a glass of Prosecco and some snacks. This really made us feeling arrived and welcome. The club lounge was lovely designed and splitted in three areas: one for the snacks with normal tables and chairs to eat and enjoy the perfect service, one with canapés to relax, and one with sofas and the bar next to it where you could have a drink. After the snack we decided to go to do a bit of relaxation and join the Spa. First we went to the Open-Air-Spa with outdoor pool, which was wonderfully appointed with a small pool and three jacuzzis. Sadly it was quite windy so we went inside and found another, beautiful and bigger spa area! A vast pool with an integrated whirlpool and such havenly loungechairs - perfect place for a nap after a long day of sightseeing... Well, I nearly overslept dinner. Firstly we didn't see the gender sperated spa area, which was a bit hidden at the end of the pool area. Inside these areas there is a changing room, a sauna, hammam, a turkish bath and a chill-out room with super-comfy loungers. At the first day we had breakfast at the main restaurant next to the lobby, where they had a big choice of bread, pastries, jams, juices, fresh fruits and jams. The coffee was not as good as in Italy but quite good as well. You could choose a fresh egg dish at the open kitchen where they had three chefs. I would say the whole restaurant has been refurbished recently and I really like the modern look. At the second day we had breakfast in the club lounge. The coice was not as big as at the restaurant of course, but we didn't miss anything and it was more quiet and relaxing then at the main Restaurant. There were much more staff members and therefore a more dedicated service. In general, throughout our stay, the two front desk staff members at the Club Lounge were amazing. I don't remember their names (Turkish names are difficult for American and Europeans), but they talked to every guest and always ensuring to give 100 per cent. Well done! The location of the hotel is very good, within five minutes walking you reach the waterfront and the Dolmabahce palace. It's close to the high-end shopping area and just 15 minutes (depending on the traffic) by taxi to the old town. We were guests of The Ritz-Carlton Istanbul. However our above written expresses our own opinion and has not been influenced.